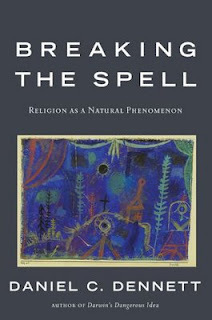 Breaking the Spell: Religion as a Natural Phenomenon is a 2006 book by the American philosopher Daniel Dennett, which argues for a scientific analysis of religions and of the pros and cons of this action, in order to predict the future of this phenomenon. Dennett implies that the spell he hopes to break is not religious belief itself, but the conviction that religion is off-limits to scientific inquiry. The book is divided into three parts. Part I discusses the motivation and justification for the entire project: Can science study religion? Should science study religion? After answering in the affirmative, Part II proceeds to use the tools of evolutionary biology to suggest possible theories regarding the origin of religion and subsequent evolution of modern religions from ancient folk beliefs. Part III analyzes religion and its effects in today's world: Does religion make us moral? Is religion what gives meaning to life? What should we teach the children? Dennett bases much of his analysis on empirical evidence, though he often points out that much more research in this field is needed.